TOEFL Speaking. Speak with the accent TOEFL iBT graders prefer. TOEFL Speaking. Speak with the accent TOEFL iBT graders prefer. Speak with the accent TOEFL graders prefer. Gain clarity and confidence to improve your TOEFL speaking score. Click to start studying with this program today. How does this program improve your English for TOEFL iBT? The program helps you improve your accent for TOEFL with many activities which are very different from the practice in traditional test preparation (like from Official ETS guides, Cambridge, Longman, Kaplan, etc.). You will see “the big picture” of all the elements that TOEFL iBT graders notice: specific types of grammar, vocabulary, accent and current test strategies. You become more confident of what TOEFL graders want by listening to and analyzing the transcripts of twelve model responses for Task 1 and 2, and three model responses each for Task 3, 4, 5 and 6. These were all recorded by Jaime (who got 30 on TOEFL speaking) or one of her real students (who got 27 on TOEFL speaking). … who are motivated and want to save money by studying on their own. 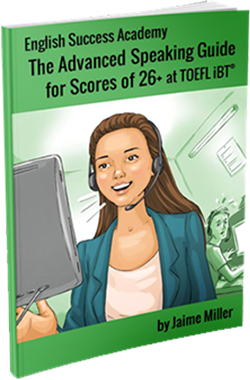 … who want to understand the logic of TOEFL iBT graders and why they give scores of 23-24 or 26+. … who have already taken TOEFL iBT at least one time before. What’s the best way to study with this? Create a regular study routine. Log into English Success Academy’s special website, the Online TOEFL Workshop. Follow the “Fail-Proof Daily Study Plan” on page 120 of the downloadable workbook. Watch videos or review activities from the workbook. Speak TOEFL-style responses every day for 4-6 weeks. – We recommend you spend 60 to 90 minutes a day for 4-6 weeks to experience measurable change, even under stressful exam conditions. “The videos helped me raise my score from 23 to 26 in speaking. Thanks a lot for helping people like me!” Sravanthi D., a pharmacist, also used Right Notes. “When I purchased Advanced Speaking guide, I swore I’d follow every advice. I practiced and practiced until thoughts flew out of my mouth. I took the TOEFL exam as my date on Valentine ’s Day with the five keys in my heart. And from 18 I turned my score to 28. I was exact on every time-limit on every speaking question, I really have to thank the videos on the site for that.” Juan R., a licensed nurse.